Kathmandu (/ˌkætmænˈduː/; Nepali: काठमाडौं, Nepal Bhasa: ये: Yei, Nepali pronunciation: [kaʈʰmaɳɖu]) is the capital city of the Federal Democratic Republic of Nepal. It is the largest metropolis in Nepal, with a population of 1.5 million in the city proper, and 3 million in its urban agglomeration across the Kathmandu Valley, which includes the towns of Lalitpur, Kirtipur, Madhyapur Thimi, Bhaktapur and the municipalities across Kathmandu valley. Kathmandu is also the largest metropolis in the Himalayan hill region. The city stands at an elevation of approximately 1,400 metres (4,600 feet) above sea level in the bowl-shaped Kathmandu Valley of central Nepal. The valley is historically termed as “Nepal Mandala” and has been the home of Newar culture, a cosmopolitan urban civilization in the Himalayan foothills. The city was the royal capital of the Kingdom of Nepal and hosts palaces, mansions and gardens of the Nepalese aristocracy. It has been home to the headquarters of the South Asian Association for Regional Cooperation (SAARC) since 1985. Today, it is the seat of government of the Nepalese republic established in 2008; and is part of the province 3 in Nepalese administrative geography. Kathmandu has been the center of Nepal’s history, art, culture and economy. It has a multiethnic population within a Hindu and Buddhist majority. Religious and cultural festivities form a major part of the lives of people residing in Kathmandu. Tourism is an important part of the economy as the city is the gateway to the Nepalese Himalayas. There are also seven casinos in the city. In 2013, Kathmandu was ranked third among the top ten upcoming travel destinations in the world by TripAdvisor, and ranked first in Asia. Historic areas of Kathmandu were devastated by a 7.8 magnitude earthquake on 25 April 2015. Nepaliis the most spoken language in the city, while English is understood by the city’s educated residents. CPN-UML’s Bidya Sundar Shakya is the Mayor of Kathmandu Metropolitan city and Hari Prabha Khadgi of Nepalese Congress is the deputy mayor. Tourism is considered another important industry in Nepal. This industry started around 1950, as the country’s political makeup changed and ended the country’s isolation from the rest of the world. In 1956, air transportation was established and the Tribhuvan Highway, between Kathmandu and Raxaul (at India’s border), was started. Separate organizations were created in Kathmandu to promote this activity; some of these include the Tourism Development Board, the Department of Tourism and the Civil Aviation Department. Furthermore, Nepal became a member of several international tourist associations. Establishing diplomatic relations with other nations further accentuated this activity. 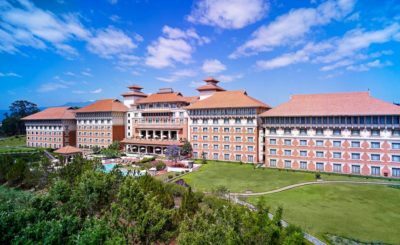 The hotel industry, travel agencies, training of tourist guides, and targeted publicity campaigns are the chief reasons for the remarkable growth of this industry in Nepal, and in Kathmandu in particular. Since then, tourism in Nepal has thrived. It is the country’s most important industry. Tourism is a major source of income for most of the people in the city, with several hundred thousand visitors annually. Hindu and Buddhist pilgrims from all over the world visit Kathmandu’s religious sites such as Pashupatinath, Swayambhunath, Boudhanath and Budhanilkantha. From a mere 6,179 tourists in 1961/62, the number increased to 491,504 in 1999/2000. Following the end of the Maoist insurgency, there was a significant rise of 509,956 tourist arrivals in 2009. Since then, tourism has improved as the country turned into the Democratic Republic. In economic terms, the foreign exchange registered 3.8% of the GDP in 1995/96 but then started declining. The high level of tourism is attributed to the natural grandeur of the Himalayas and the rich cultural heritage of the country. The neighbourhood of Thamel is Kathmandu’s primary “traveller’s ghetto”, packed with guest houses, restaurants, shops, and bookstores, catering to tourists. Another neighbourhood of growing popularity is Jhamel, a name for Jhamsikhel that was coined to rhyme with Thamel.Jhochhen Tol, also known as Freak Street, is Kathmandu’s original traveler’s haunt, made popular by the hippies of the 1960s and 1970s; it remains a popular alternative to Thamel. Asan is a bazaar and ceremonial square on the old trade route to Tibet, and provides a fine example of a traditional neighbourhood.